DON MANUEL had three daughters before he finally got a son. Baby and Nini were followed by a third girl who died in infancy. She was to have been the god daughter of the first Mrs. MacArthur, Louise Cromwell, and it was this lady, whom the Quezon children called Auntie Louise, who place the shroud on the child. The death of their baby daughter so grieved Quezon and Dona Aurora that they had that part of their house where the child died demolished. Joy followed sorrow two or three years later when Mrs. Quezon gave birth again, this time to a boy. Some time before her confinement, Quezon took her driving one afternoon. They drove out to the old road to Marikina. He had, he said, a surprise for her. This was in 1926, and there was, of course, no Quezon City yet. All that region was still lonely pasture and land wilderness. At a point before the road dipped toward the Marikina Valley, Quezon had the car stopped. He and Dona Aurora got off. He told her they were going for a walk. They trudged up a rocky, weedy incline. Suddenly they were on the edge of a cliff. Below them lay the Marikina Valley, a spread of green. In the distance, like ramparts, stood the mountains of Antipolo. And farther beyond, a coronet of cloud ever circling its summit, rose Mount Banahaw, the chief landmark of the Quezons’ native province of Tayabas. As Dona Aurora gasped with delight, Quezon told her that this was the surprise. He had bought this cliff for her; it was his present to her. The place was known as the Barranca and must have looked even more desolate in those days, but Quezon knew what his wife liked. She had never really become a city woman and was happiest when in the country. (Later, after her daughter Baby had turned 18, Dona Aurora would delegate as much as possible her tasks as Malacanan hostess to Baby, and devote her time to looking after the Quezon hacienda in Arayat). Besides, Quezon may have been aware that, from the Barranca, one can see, not only Tayabas, but the break of dawn: he was giving his wife a place associated with her name. Along this property Quezon bought for his wife now runs Aurora Boulevard; and on the cliff itself lives their son Nonong, whose imminent birth had occasioned the present. Then he went off to celebrate, and the story is that he drank and drank all night, turned up at his office the next morning cold sober. His ability to hold his liquor is part of his legend. He liked drinking but not drunks, and was impatient with people who could not, like him, emerge from a night of carousing with a clear head. As his child Nonong grew older it was noted that he would be the dark one in the family. Baby and Nini had inherited their father’s very Spanish coloring: a light complexion tinged with pink, deepening into rose on the cheeks. Quezon never lost that vivid coloring; even when wasted by disease, he did not turn pallid or yellowish; and what Nonong Quezon remembers of his dying father is that startling bloom of health in the face of a man who was mortally ill, bed-ridden, enclosed in a sick-room, no contact with fresh air or sunshine to explain those roses on his cheeks. Quezon was conscious that, except for his height, he did not look Filipino, and he was delighted when he saw that his child Nonong was a moreno. The Quezons then lived on Roberts Street in Pasay. Dewey Boulevard had still to be built, and the sea came up to the Quezon’s back yard. It was a two-story house of good hard-wood, with a U-shaped driveway in front, a strip of lawn behind, where towered two pines. This was the first home Quezon owned, if one excepts the nipa hut in Baler where he was born. During the first years of his marriage, he rented a house in the Manila district of Sta. Ana, in Lamayan. Around 1920, he bought the Roberts Street house and in it was born his second daughter, Nini. There the Quezons lived until they moved to Malacanan. The house was renovated several times, was destroyed during the war. Its ruins still stand, high walls still enclosing the now-silent enclosing the now-silent space of ground where, during the most turbulent years of his public career, Quezon secured for his family a very quiet and private life. This was in the days before the belief became current that, when a man enters politics, not only he but also his family and his house become public property. Politicians’ houses nowadays are like marketplaces, with crowds streaming in and out all day long, even when it’s not an election year. But Quezon was the old-fashioned kind of politician who believed that the public had the right to scrutinize his public actuations and, perhaps, even pry into his personal habits, but had absolutely no right to invade the home life of his family. And the people of that time respected the right to privacy of a politician’s family; the public pursuit of Quezon stopped at his front page. Nonong Quezon can remember no daily mobs turning his home into a public plaza. Occasionally, there were parties for politicians; tables were set out in the garden; and a lot of people arrived. But Nonong says he went on playing in the back yard undisturbed by the crowd. One or two visitors might approach and say a word to him; there was no rush of news photographers to get pictures of the Senate president’s son at play. His earliest impression of his father was of someone perpetually going out and coming back: a very busy man. There was also an impression of elegance, of beautiful clothes; a further puzzled awareness that Dad was not always as strong as he looked. The young Nonong had seen his father being borne upstairs in a chair; and there was one time when he had clambered over Dad’s legs, wanting to be hoisted up, and was admonished that Dad was not feeling well. But when Dad was feeling well he was willing to horse around with Nonong: roll on the floor with him, carry him piggy-back. Dad had a favorite threat: “Susuntukin kita sa punong tainga (I’ll box you on the tips of your ears).” And sometimes he playfully carried out the threat, pushing his hand against one’s ear, then chucking one on the chin. Nonong had a vague idea that Dad was an important man. “What’s your salary?” he asked Dad once. “One peso”, replied Dad, with a grave smile. Nonong also had a vague idea that he was expected to be a politico when he grew, being then son of such a great politico. “What would you like me to be when I grew up?” he asked Dad. “Whatever you like, hijo”, said Dad, chucking the boy on the chin. Sometimes Dad took him along to where he worked, the big house. From one such trip, Nonong, in the front seat beside the driver, heard Dad, in the back seat with another politico, talking incessantly about camara, the camara, the camara. What’s that camara they’re talking about, wondered Nonong, not knowing that Dad ad his friend were talking, not about the box with which you took picture, but about the Lower House of that big building where the politicos worked. That particular memory stuck in Nonong’s mind because, later, having got tired of talking about the camara, Dad asked the driver to let Nonong hold the wheel. Dad knew Nonong was fascinated with cars and liked to pretend he was driving one. Another early memory with a car in it is of a trip to the provinces along very dusty roads. Dad didn’t want the children to breathe the dust; so he said he was going to teach them a song about the nose. The lyrics were simple, just a repetition of the word “Ilong, ilong, ilong!” But as you chanted the word you had to hold your nose tight between your fingers. Whenever Dad saw a particularly dusty stretch of road in the offing he would start the children singing “Ilong, ilong, ilong,”their noses pinched between their fingers. And he sang along with them, holding his very patrician nose between his fingers too. Of his first trip to the United States, when he was about four, Nonong remembers only that it was the time he and his sisters had their tonsils out, one after the other: “I remember being taken to the hospital by Dad, then Baby being wheeled out, then myself being led in.” Dad, says Nonong, was a great ‘friolero’, very sensitive to the coldâ€ which may explain why Nonong has no memories of his father showing him the sights of Washington, since Don Manuel, whose Spanish heritage did not include imperviousness to wintry winds, could not have relished exposing himself to the chilly weather of the American capital. 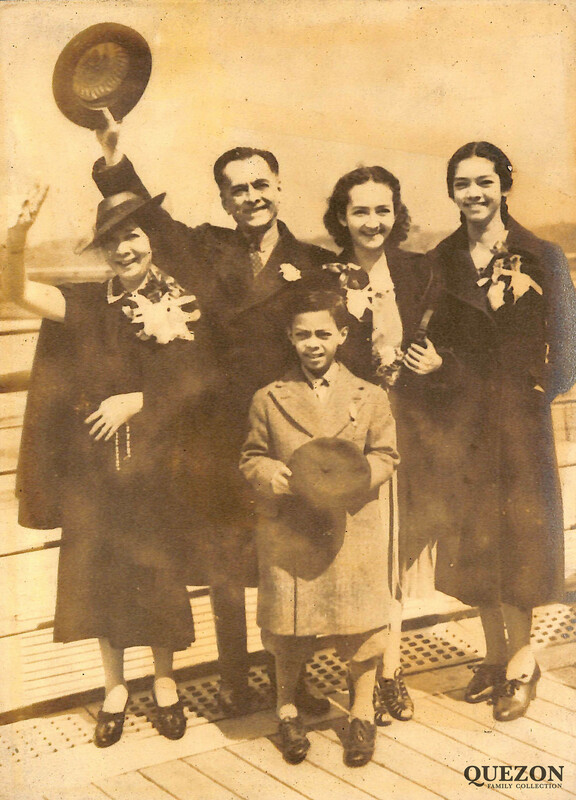 That particular trip to the United States, in 1930, was an important chapter in Quezon’s life. He had been a”fallen-away”Catholic since the Revolution and had joined the Masons. During that 1930 voyage to the U.S., right on the international date line, and on the eve of his 52nd birthday, Don Manuel returned to the Church. He had, says Nonong, long fallen away from Masonry too, but he made a formal retraction to Archbishop Michael O’Doherty, a co-passenger on the ship during that August voyage to America. “It has been twenty-five years more or less since I left the communion of the Catholic Church, to which I belong by virtue of baptism, like my parents before me. This separation of mine from the religion which guided my boyhood, adolescence and the first years of my mature life was due not only to the fact that I had lost my faith but that I had joined Masonry”. “During those twenty-five years, I did not embrace any other religion. “I have to confess with shame that, in the course of such a long period of time, I forgot, in fact, my God and may even have ceased to believe in him. “The day came when I felt a complete desolation in spite of the material goods I enjoyed, and I found that the cause was my want of faith in supernatural life, my lack of religion. When Quezon returned from America, word of his conversion had spread but was widely doubtful until Don Manuel was seen publicly attending mass. Nonong says that his father’s conversion was an intellectual one and that he remained devout all the rest of his life, with a special devotion to our Lady of the Immaculate Concepcion and to St. Therese of the Child Jesus. An image of the Purisima that had been in the Quezon family for generations was kept by Don Manuel even during his non-Catholic years, enshrined in his bedroom. Nonong was sent to study at La Salle. (Escorting him to school during his first years there was a detective named Alejo Santos, yes, he is the present defense secretary). Don Manuel had gone to Letran and many people wondered why he didn’t send his son to his old school. Don Manuel explained that the Dominicans at Letran were so fond of him they would surely have spoiled his son. Cocido Espanol, says Nonong, was his father’s favorite dish. Don Manuel also liked sinigang and inihaw na isda; and when the fare was native he loved eating with his fingers. Being a Tayabeno, he had a taste for deer’s meat, dried and fried, and eaten with champorrado. He wanted his hot chocolate in the Spanish style: thick enough to cut. But he had been Americanized enough to be a morning-coffee addict, and a percolator graced the Quezon’s breakfast table long before coffee became fashionable among the local gentry. Quezon would start guzzling coffee as soon as he woke up -â€which was usually at around five dawn”- and he didnÃ¢’t like to guzzle his coffee alone. His usual coffee companion was Don Tomas Morato, a close friend since boyhood, and for years Don Tomas rose before five in the morning to go to Malacanan and have coffee with the Presidente. One morning there was a typhoon and it looked as if Don Tomas wouldn’t show up. Quezon called him up to say that the coffee was waiting. Don Tomas abandoned his warm bed with a sigh, put on some clothes and braved hurricane and flood to have a cup of coffee at five in the morning with el senor presidente. Of the elections in which his father won the right to occupy Malacanan, Nonong remembers only the night he was allowed to stay up and await the election returns with the family. Soon after, he was made to understand that the family would be leaving the Roberts Street house. He didn’t want to leave his old home but at the same time thrilled with a sense of adventure at the thought of moving to another, unknown house. On inauguration day, November 15, 1936. Nonong accompanied his family to the Legislative Building and saw his father sworn in as president. Nonong, then only about ten years old, was wearing the uniform of an aide-de-camp: white with gold braid. That night -or, possibly, the following night- he and his father and Morato drove to the Palace to take possession of it. Mrs. Quezon had still not finished packing and remained at the Roberts Street house with the girls. Nonong remembers driving to the front gate of Malacanan and seeing an American soldier at a table near the driveway. The American opened the gates and the three Filipinos entered. They ascended the main stairway and were shown to the private quarters of the Palace. The Palace, says Nonong, made no great difference in his and his sisters’ lives: their existence remained sheltered; they didn’t see their father any oftener or less than at Roberts. School report cards still had to pass his inspection; there were still lectures if one was caught being naughty. Neither Quezon nor his wife believed in using the rod on their children and Nonong remembers only one of them ever being spanked: Baby, for her headstrong temper, and Dona Aurora, who administered the punishment, quickly realized it was no way to discipline the spirited girl. Nonong was now big enough to feel the influence of his father’s glamour and to want to be like him: a good talker, a good dresser, and so forth -the so forth including such things as Dad’s finesse as a dancer. Though dad was a small man he felt no shyness about dancing with women bigger than he -American women, for instance- and because he didn’t feel ridiculous he didn’t look it. That was one of the many things he could carry off because he had natural dignity and self-assurance. But there were times, recalls an amused Nonong, when even Dad’s savoir-faire on the dance floor failed him. At another ball, this time in the provinces, the senor presidente again had the misfortune of asking to dance with him a lady who did not have to be coaxed, though she, too, it turned out, was another “log” on the dance floor. The orchestra, knowing that when Don Manuel started dancing he didn’t like to stop, played tune after tune without a pause. Round and around stumbled Quezon and his persistent partner. Finally the suffering spectators saw a sweating Don Manuel desperately signaling the orchestra to stop, for God’s sake, stop! Dancing was Don Manuel’s true hobby, his favorite pastime, and he could pass without effort from the passions of the conference room to the light-heartedness of the ballroom. His years in Malacanan were the gayest in the history of the Palace. He had no time for sports, but loved horseback riding. He had no time for reading either, but was fascinated by the biographies of great leaders. He could play the piano a little and wanted all his children to learn to play it well. But, after politics, his great talent was for dancing; he had mastered the rhumba just before the war broke out -and the dearest memory of Commonwealth days is of Don Manuel, urbane and handsome and elegant, dancing all through those years where it was almost more important for a politico to know how to tango than how to get votes. The day the pacific War broke out, Don Manuel was in Baguio with Baby. Dona Aurora was in Arayat with Nonong and Jovita Fuentes, the opera star. Nonong saw the Japs bombing nearby Fort Stotsenberg (it’s now Clark Field). That night, his father arrived in Arayat to pick them up. They sped to Manila, but not to stay in Malacanan. During the first weeks of the war, the Quezons were at their Marikina estate, the Barranca, where a spacious air-raid shelter had been built. On Christmas Eve, they returned to Malacanan for the last time. They went there just to pick up a few things; then they were evacuated by boat to Corregidor. They heard midnight mass within the fort’s tunnels, shared the turkey dinner of the mess on Christmas Day. At midnight of February 19, 1942, they were flown to Australia on a B-17 Flying Fortress. Nonong says he remembers the date because it was his mother’s birthday: “And I’ll always remember when Bataan fell because that’s Nini’s Birthday.” Nonong recalls that his father was very silent while boarding the Flying Fortress for Australia, but the anguish of departure was blunted by the excitement of flying: none of the Quezons, except Dona Aurora, had flown before. Exile for the Quezons meant a hotel suite in Washington, at the Shoreham, where Don Manuel steadily wasted away. Says Nonong: “I think my father died a saint.” Whenever he was in pain, Don Manuel would say to his wife: “I am offering my sufferings to Our Lord, for our country.Ã¢” But the famed Quezon temper still exploded at times and then one heard the voice he was forbidden to raise thundering from the sickroom, spilling forth the dreadful Spanish expletives that used to send Malacanan folk scurrying in all directions. There’s a little known description of the dying Quezon by Carlos Bulosan, the writer, himself tuberculous, who visited the sick man in November, 1943. “He wanted so much to say something and he opened his mouth to say it, but his eyebrows came together in gentle pain. After a while he controlled his voice, said a few words, one word every three minutes; but he went on although it was choking him because he had something to say to me. Now and then his hand went to his mouth as though he were urging the words to come out, turning to look at me in his wordlessness. “He asked me how old I was and what was the matter with my health. I told him and he turned away, putting his hand to his face. “I felt that I was incapable of writing the life story of so great a man; so I simply looked dumbly at him for a few minutes. The pain had come back to the President’s face and he turned away to let it subside. I knew then I had to go. He gave me his fragile hand. In the summer of 1944, the Quezons went to Lake Saranac, a vacation resort with a sanatorium for the tuberculous. The doctors there pronounced Don Manuel very much improved. They approached the bed one by one. Nonong laid a cheek on his father’s brow and lightly chucked him on the chin, the way Day used to when Nonong was a child. That afternoon, Don Manuel Quezon lady before the altar of the hospital chapel, not in a coffin but on a couch, arrayed in formal wear. Nonong did not attend the funeral in Washington. He stayed with his mother in the hotel suite. Only Baby and Nini followed the coffin to Arlington Cemetery, where it was placed in the mortuary where the remains of distinguished foreigners who have died in the U.S. are kept until they can be returned to be buried in their own countries. Quezon’s coffin was placed alongside the coffin of Ignace Paderewski, the great musician who became president of Poland. The two men had known each other, had been co-passengers on the Ile de France during a trans-Atlantic crossing, when Paderewski was his country’s president. The first time the two men appeared together in the ship’s dining hall, the orchestra was bidden to play the national anthems of Poland and the Philippines. The orchestra played the Polish anthem; then there was an embarrassed pause: who the heck knew the Philippine anthem? Quezon rose, went to the piano, and tapped out the first notes of the Marcha Nacional, the orchestra presently joining in. That was the night Quezon the amateur pianist played for the great Paderewski. Nonong, now 35 still boyish-looking, lives on his family’s old Marikina estate, the Barranca. A mossy wall surrounds the place. From the gate one wanders in puzzlement across what seems an abandoned villa, returning to wilderness. Among the weeds and trees, one sees ruins -the ruins of a stone house, the ruins of a swimming pool. Then one comes to another fence, another gate. Past the gate in glossier greenery and a modern bungalow perched on the edge of the cliff. The view from there is spectacular. Just below the cliff are rice terraces, just as picturesque and rather more astonishing than the ones in the North, for who would expect to find rice terraces in the suburbs? The Marikina Valley is a cool green undulation in the daytime, a necklace of lights in the evening, strung between Marikina town and Pasig. Behind the ramparts of Antipolo looms Mount Banahaw, with its eternal coronet of cloud. Though suburbia has reached the Barranca, it retains its old air of solitude, almost of desolation, being still as mute and wild as on that day in 1926 when Don Manuel showed it to his wife and told her it was hers. I, as a tennager would often be taken by my father to visit his old classmates. Manuel Quezon, Jr. was his classmate at De La Salle. Images are now blurred. Now, I am writing his son, Manolo. If the Philippines had a coat or arms, the Quezon family would be the jewels that embellish it! I am a Tour Operator in Quezon Province and does the tour guiding myself. In all those travels I would really like to talk about the great MANUEL L. QUEZON I’ve hear so much. Unfortunately, in all the readings that I have, I didn’t find an article so good as this. After this reading, I know what to convey my guests, especially FILIPINO GUESTS because now I can be very proud about MLQ and my province. If I can borrow the words of Mr. Jose Miguel Razon, the Quezon Family are jewels that embellish the Philippines Coat of Arms! Now, the more i can hold my head up high in bringing my Quezon Province to ldomestic and foreign tourists alike! The BEST President ever for the Philippines. Why? ompare him with others. I love him and Magsaysay.